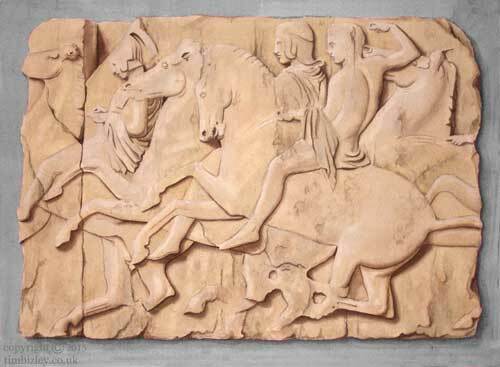 The client had an interest in military history and this section of the Parthenon Frieze was chosen as the focal point for a grisaille mural scheme extending over the four walls of a dinning room. The shallow perspective of the trompe l'oeil enables the trick of the eye illusion to work from multiple view points. A painted mural can create a unique ambience and develop an inspiring environment in which to live or work. Decorations undertaken by a muralist subtly modify our perceptions of space and atmosphere. Colours and tones used by the artist can be modified to balance with the lighting of the room and the fabrics and furnishings, thereby establishing a harmonious whole within the room itself. see below for preparatory sketches. 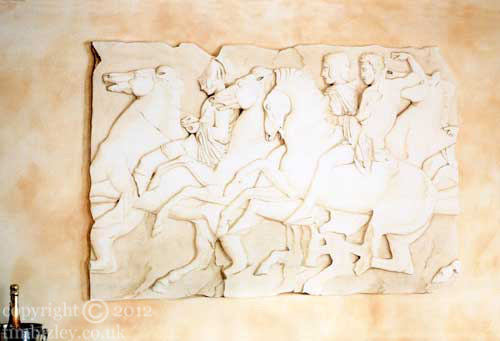 I usually produce preparatory sketches for a mural to flesh out the design for the client and to establish that the the details of the design work.